While attending the Accelerated Experiential Dynamic Psychotherapy (AEDP) Immersion training last month, Hilary Jacobs Hendel’s book It’s Not Always Depression was identified as a very important offering reflecting the fundamentals of how AEDP works to address transformative change. She apparently has been able to strike a nerve in the collective, helping lay people and professionals alike understand the importance of identifying core realities about family of origin issues, including neglect, trauma, etc. I did attend a presentation years ago by a mental health managed care company orienting primary care physicians to the importance of helping patients recognize their depression or anxiety profiles as biological, setting up the primary intervention as biochemical. For me, the unintended(?) consequence of this was it discouraged physicians from believing in the importance of their role in standing in for the good enough ritual elder, who, in caring about your life and your troubles, helps you believe in your goodness, and your resources, in finding a way to better manage life’s joys and sorrows. I knew at the time this was message was just plain wrong and said so. It was a spirited debate, but, alas, many good people, providers and patients alike, continue to believe in the need to treat depression as a disease, not a reaction to human life situations. * (see comment below) I do appreciate the important role medications can play in the mobilization and recovery process, but we all are in need of support to recognize our life trajectory, and create a narrative which strives to hold the joys and sorrows which are both our ancestral inheritance and the source of enlivenment and meaning. Poking around, I see she has a series of four posts discussing “Getting to Know Your Three Brains”. See: https://www.hilaryjacobshendel.com/single-post/2018/04/09/Getting-To-Know-Your-3-Brains-Part-1-How-Brain-Knowledge-Helps. These are very focused daily process guides to correcting one’s one-sidedness, in the direction of hearing from our minds, emotions, and bodies. She identifies the Self as the core consciousness which can function as the Maestro in the orchestra of the three brains: mind, emotion, and body. With response ease in mind, I wanted to post these resources and encourage you to check out her work. She seems to be an embodied translator of the AEDP process work, with very accessible applications for self-guiding this work. From my work, the archetypal layer and realm of the complexes contributes a depth which speaks to the possibilities of just how episodic memories of trauma get stored and are indeed waiting to be re-discovered by ego consciousness, in the service of healing original wounds. To be continued. Catching up with old friends over the weekend, I found myself trying out the frame “trauma complex” as a way to describe what I’ve been working on in terms of my resource blog. My apical meristem if you will. I am using the term trauma complex to suggest split off, encapsulated, episodic memories, memories which when viewed in their experiential state form, image and associated affect, were likely to have evoked archetypal layer resources. Jung’s complex theory suggests the nucleus of a complex is composed of two elements: the image of the scene of the wounding and it’s associated evoked archetypal node/energy/affect. Note the the experiential state, including the red C designating it is also the nucleus of the complex, all contained within a capsule. The encapsulation detail helps us remember the importance of recognizing the partial cure as a solution which must be mortified. The dissociative defenses maintaining the partial cure will not allow direct, healing contact with the original wound episode. Until we can drop the partial cure defenses, we will continue to be locked out. Gazing upon the image, I must say it also looks a bit like a bandage! Here my emphasis is the trauma complex is a more or less effective container for binding and containing an episode of this-world-relational-failure, with, importantly, it’s associated evoked mythological/archetypal image and affect. I proposed this in my Musings on Metamorphosis: the Complex as Chrysalis post. This system for managing the original split off trauma relies on encapsulation of the original wounding, like the oyster’s ability to create a pearl. Next time around I want to talk about this from the perspective of dueling partial cures. Yours? Mine? Shall we dance? Mystery and Complexity versus Nuts and Bolts? Perhaps like the alchemists of old, I continue to have energy for trying to find the keys to open the locks to all that would bind us. In practical terms. In everyday life sound bites. This morning, early, I am feeling gratitude for this life and this view. May we all be blessed with the gift of the questions which keep on coming. So, the work goes on: How can/will I describe the ineffable, today? Thinking about my conceptual frame Couple Experiential State Complex as Activated Threshold, I have been struck this week by the importance of focusing on tracking when we, self and others, get emotionally triggered. By using the word triggered, I am hoping to tap into our collective, universal sense of knowing we are getting hijacked by something intensely emotional. As in getting one’s button(s) pushed. A classic extreme example referenced in the early diagnostic manual for PTSD is if you were raped in an elevator, just seeing an elevator can evoke or trigger intense emotional and physiological reactions. I have been making the case a spike in emotional intensity is the simplest indication we are activating/activated, announcing to all who can perceive, the presence of the blur. From this perspective, if/when a microfracture in communication pulls us into a blur state, how can we recognize the conflict as meaningful? Might this really be an unbidden, spontaneous opportunity for healing? What if there is no such thing as fighting over little stuff? Fred Kaufman has a post on LinkedIn Every Emotion Is A Love Story. I find this to be a great opener. If we can trust the emotion is right, but our consciousness of context and setting may be confused, we can turn our energies towards trying to drop into the deeper story. As Rumi advises in A Night Full of Talking: Everything has to do with loving and not loving. If we try on making the case the emotion is correct, how can we access the trauma complex driving the blur? Under what circumstances is this present overwhelming emotion appropriate? Preparing oneself to enter into such a healing moment includes learning to see the power struggle as a co-created complex. From this perspective, the ritualistic elements reflect what we think of as repetition compulsions or re-enactments of the wounding. In alignment with Bromberg’s description of co-created dissociative enactments, these serve to bring the essence of the original wounding, with it’s associated transference and countertransference dance, palpably into the present moment. In his discussion of the complexes, in their favorable aspect, John Perry observes: “The repetition compulsion, as has been pointed out so often, provides the ego the occasion again and again to encounter these rejected components of development in order finally to assimilate them in some happy moments….” My sense of what he means by “rejected components of development” is simply the recognition the absence of an elder presence allowed the violation to overwhelm the vulnerable child or adult, necessitating the activation of archetypal layer defenses, ie: a trauma complex. What was needed at the time to understand and work through the emotional overwhelm is still needed. I have played with this in thinking about the function complexes serve in my Musing on Metamorphosis: the Complex as Chrysalis post. I have to confess for me, teleology is a big word! But, I believe it works! 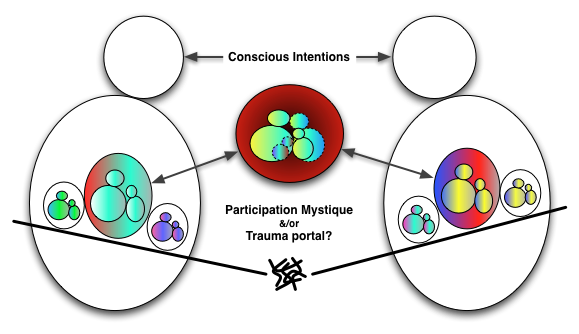 In closing, I have included the graphic above to highlight the Participation Mystique &/or Trauma Portal detail. We are all involved all of the time with some deeper level of consciousness, a multiplicity of self-states if you will, which wants to inform us about what more is going on. Because I tend to think about getting hijacked into negative emotion enactments, I find the idea getting triggered serves the blur’s function in opening a portal into the associated trauma. The repetitive couple complex enactments do seem to provide a portal into our most painful relationship failings. Clearly, we need each other to approach going there. What is needed may be as simple, and as difficult, as dropping into the original scene, so that we may feel all of it, within relationship, bear witness together, and get the story told. (See Sandner and Beebe for an articulation of what it takes to heal a split.) This reflects the conceptual notion traumas, until they can be suffered consciously in the service of re-integration, are incomplete initiatory experiences. Creating the conditions, essentially accessing a consciousness that can bear to suffer the wounding without splitting, is the work. If we can only hold onto the here and now, this world enactment – what you/he/she/they did or did not do to uphold our loving – we are doomed to continue with our co-created dissociated enactments. When all has gone well developmentally, each self – state is compatible enough with the modes of being that are held by other self – states, to allow overarching coherence across self – states, which in turn creates the capacity for sustaining the experience of internal conflict. In treatment, however, when proactively protective dissociation is operating, self – state shifts are most likely to reach the analyst’s perceptual awareness if he is able to freely engage his patient with the stance of participant – observer. Or so I contend. Why should this be the case? Because the shifts may be discerned initially not as something in the patient, but as a destabilization of the analyst’s own mental processes, an awareness of discomfort that he does not immediately recognize is a discomfort that is linking him to his patient through a dissociative enactment that is taking place while they are participating at a verbal level.” Page 72-73. Comment: I will be creating a separate page for this source quote at some point. For now, I wanted to get it posted in anticipation of commenting on it from the perspective of more language and theory about others, entities, agents, archetypes, components making up experiential state scenes, figures populating the nuclei of complexes, and the images and affects associated with invarient organizing principles. My interest in the blur reflects my tracking of the importance of finding a way to embrace these less conscious beings that keep trying to show up in the service of winning back as much of our lost selves as humanly possible. Reading that last line above and my choice in using the language “less conscious beings” I am struck with the need to clarify “from who’s perspective?” The challenge is recognizing that these beings have their own consciousness. It’s more of a question of how much awareness, on a continuum, might we have in a given moment of their presence or influence. Something like that. Philip Bromberg, The Shadow of the Tsunami and the Growth of the Relational Mind. 2011.